Chocolate fudge brownie mix with white, dark and milk chocolate pieces. The perfect chocolate trio for chocolate lovers! 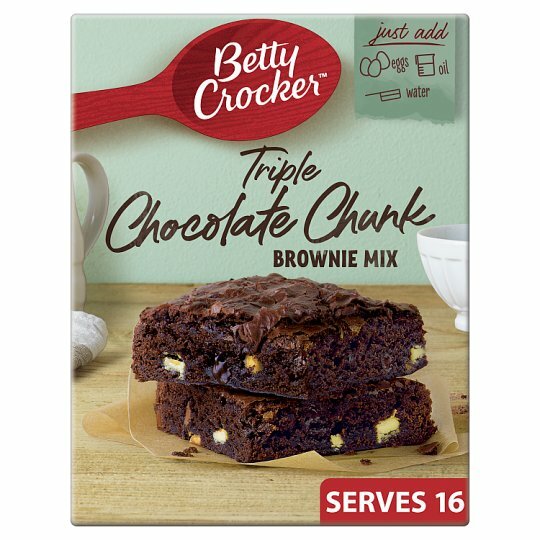 This triple chocolate brownie, filled with an indulgent mix of white, dark and milk chocolate chunks, is crunchy on the top with a gorgeously gooey inside... total chocolate heaven! So grab your apron and mixing bowl and fire up your oven to 180°C (160°C for fan assisted ovens)/Gas Mark 4 - let's bake up a batch! 3 Bake in the centre of the oven for 10-25 minutes or until a rounded knife inserted 5cm (2") from edge of tin comes out almost clean. Allow to cool before cutting into slices and having a delicious slice yourself.....mmm! Add 1/3 cup of nuts to add a little extra indulgence and crunch.